Learn How to Store Weed So It Lasts! How Long is My Weed Good For? When it comes to storing your cannabis, the method you choose makes a huge difference in how long your buds maintain potency and freshness! But what’s the best way to store weed? Is it vacuum-sealing? Will freezing your buds hurt them in any way? I’ve tried a few different methods for storing marijuana over the years, and today I want to share what has and hasn’t worked for me! 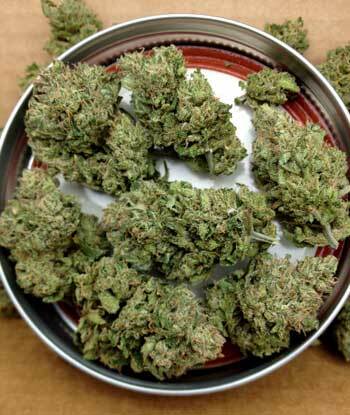 Note: Some people actually prefer the effects of wet-cured or very long-cured buds, which tend to be very smooth and offer unique smells, but can also cause buds to take on a mostly brown or tan appearance. In that case, buds should still “stay together” and not be crumbly. Although there are exceptions, usually buds that have turned brown are losing their overall potency and smell as time goes on. If you grow a lot of cannabis at once, you may want to store it so that it lasts until your next harvest! Some growers only harvest once a year (especially outdoor growers) and may need their bud to last until the next fall harvest! Luckily it’s pretty easy and cheap to store your bud. You don’t need any special equipment besides an air-tight glass jar! Air-tight glass jars are the best place to store cannabis buds! What’s the Best Method for Cannabis Storage? A cool (60-70°F or 15-21°C) dark place is the most popular way for growers to store buds, and is one of the best and most effective. 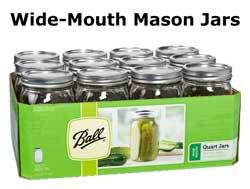 Quart-sized glass mason jars are found everywhere from grocery stores to home improvement stores. These are often used for cooking (making preserves or marinades for example), but when it comes to storing cannabis they help maintain potency by protecting buds from moisture and air. Glass jars will also completely contain smells while preventing buds from getting crushed during handling. Make sure jars are at least 3/4 full so there’s not as much air being stored in with the cannabis (if you have less bud, use smaller glass jars). Buds stored in airtight glass jars in a cool, dark place will maintain their potency for a year or more. Once buds are completely dry and have been stored for at least 4 weeks, you can freeze them and they will maintain their potency for years. Some growers double-bag buds in Freezer bags and then wrap the bags in foil. This works okay but you can actually store your buds directly in glass mason jars. If you’ve got a lot of bud that needs to be stored for a long time (multiple years), the freezer is the best way to do it! Note: You should avoid handling frozen buds as the trichomes (glitter) become brittle and can easily break off at freezing temperatures. Always let frozen buds come to room temperature before handling. Buds stored in the fridge tend to mold, even in air-tight containers. Either keep buds outside the fridge or put them in the freezer! If you must use the fridge, it’s especially important to make sure buds are completely dry to avoid mold, and keep them in the back in a crisper where the temperature and humidity don’t fluctuate as much. But again, if possible you should avoid using your refrigerator to store buds just in case; a regular cabinet or drawer is usually better! Although this is the most common way for non-growers to store cannabis, it’s one of the worst. 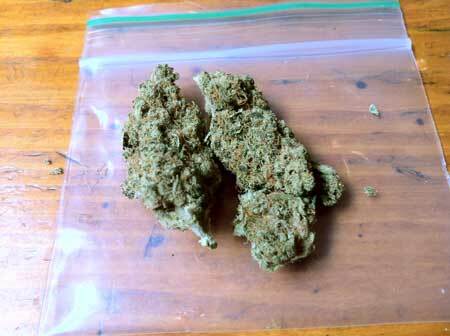 Buds lose their smell and tend to get dried out and brittle in plastic baggies. 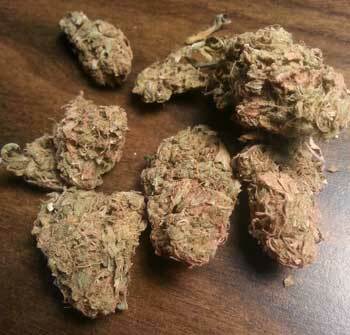 The potency degrades quickly, and the lack of protection means that handling the buds tends to crumble them. Plastic baggies should only be used short term, or avoided altogether. If you need to store a small amount of bud, it’s recommended to get a UV-proof glass stash box (will also prevent smells from leaking out!). As a bonus, a small glass container can help buds continue curing. Don’t use a plastic baggy! Note: Freezing buds is controversial because it’s easy to lose trichomes when moving frozen buds. You do need to be extremely careful when handling frozen buds as the trichomes (glitter) become brittle and can easily break off at freezing temperatures. However, if this does happen you can still collect trichomes from the bottom of the container and use them (just like the kief that falls to the bottom of a grinder! ); the trichomes do not “vanish” into the ether! Additionally, you can dramatically reduce this problem by always letting buds come to room temperature before handling them. The fact of the matter is that buds will stay potent for longer in the freezer than if kept at room temperature, so it’s up to you to decide whether the risk is worth the reward. I can tell you that many growers freeze their buds for years to maintain potency, especially outdoor growers who may harvest pounds at a time. So if you want to use the refrigerator to store buds, don’t risk mold by using the fridge portion – put your buds in the freezer! Weird fact: Ever notice that the word ‘refrigerator’ doesn’t have the letter ‘d’ in it, but the word ‘fridge’ does? Although ‘fridge’ and ‘frig’ are technically both acceptable spellings, one proposed explanation is that the word was originally spelled ‘frig’ but adding the ‘d’ and ‘e’ became much more popular since the word is pronounced as if it rhymes with ‘ridge’. 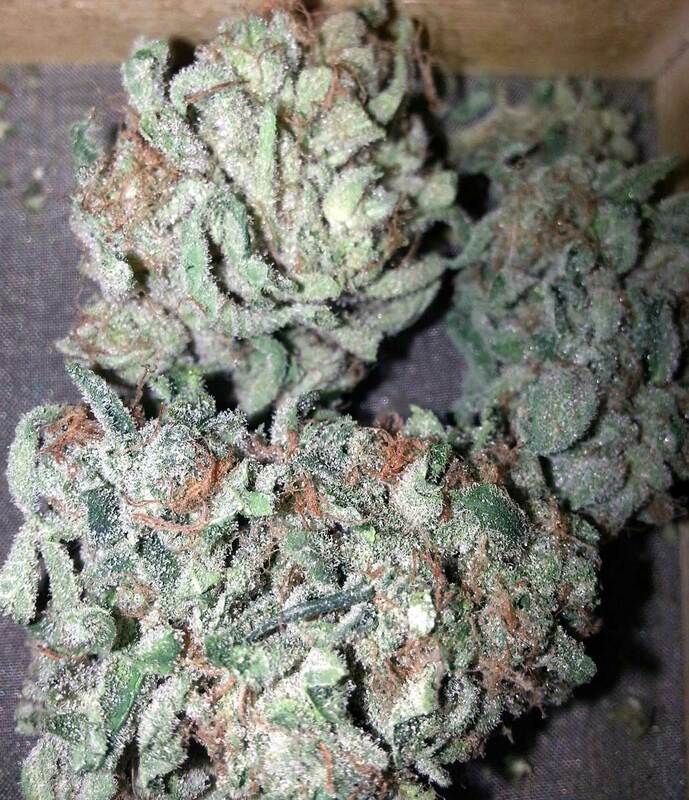 If using Freezer Bags (as opposed to glass jars), buds may lose some of their smell/flavor over time due to the plastic, and are easily damaged from handling in their frozen state. However using glass jars in the freezer will help prevent these problems. Should I Use a Vacuum Sealer? You can use a vacuum sealer to take all the air out of a container before long-term storage. You can use these with bags, and you can also use these with actual mason jars! Vacuum sealing is recommended if you plan on storing buds for a long time, and it’s probably a good idea, but in my experience it hasn’t seemed to do much (at least on its own) to slow down the bud degradation process. When I experimented with vacuum-sealing buds in mason jars, I found that the vacuum-sealed buds didn’t seem to be any different from the same batch of buds stored in non-vacuum sealed jars. After a year of storage, they looked and smoked the same as far as I could tell. So even if you do vacuum-seal your buds, make sure to follow all the other steps, too! Boveda Packs – A Helpful Storage (and Curing) Tool! Sometimes called Humidipaks (their old brand name), the newly renamed Boveda Packs can basically turn any airtight space into a cannabis humidor. 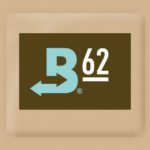 The 62% Boveda Packs are specifically designed for storing cannabis and can be placed in a sealed container with your buds to regulate the humidity to the ideal level for marijuana storage. Boveda packs also help keep buds from getting dried out or brittle (and can re-hydrate buds that are too dry). Bonus Use: In addition to storage, for those who have trouble getting buds to cure properly, these can be a valuable part of the curing process! Simply place them in your jars a few days into the jar-burping process to help regulate the humidity. If buds are still fresh and green, they need to be cured before being put into long-term storage! 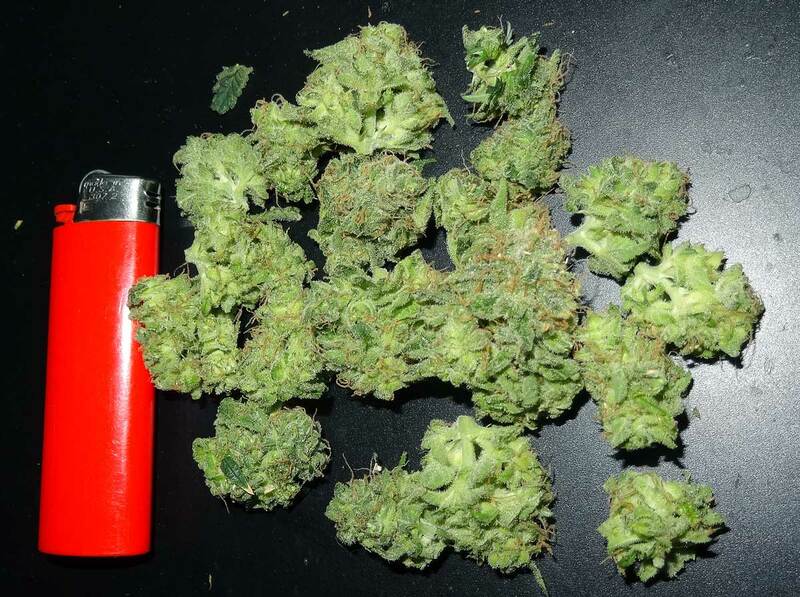 Example of Fresh Bud (May Feel Wet and Usually Appears Very Green and “Plump”) – Never put fresh bud into long-term storage! Cured Buds (Color Has Darkened Slightly, Buds Feel More Dense and Are Completely Dry) – Always wait for buds to cure for at least 4 weeks before long-term storage! Whenever Storing Cannabis Long-Term, Make Sure…. Buds Have Been Cured for 4+ Weeks – Buds should be cured at least 4 weeks before being put into long-term storage. The potency and smoothness of your buds is greatly improved during the curing process, and you want to make sure they’ve reached peak potency before you put them in storage. 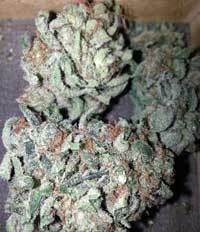 Additionally, the curing process is integral to setting a good moisture level for buds about to be stored long term. Buds Are Dry Enough (55-62% Humidity) – Buds should never feel moist and jars should never “sweat” during the curing process. These are signs the buds still contain too much moisture and aren’t ready for storage. Why? Even in a sealed container you can still get mold, and wetness causes potency to deteriorate faster (and buds turn brown and crumbly)! This is really important, because buds being too wet is one of the biggest factors that cause buds to degrade early. If you have a humidity monitor, you are aiming for humidity around 55-62% RH before putting them into storage. This recommended humidity is a little lower than what’s generally recommended for curing, but helps prevent unwanted biological processes during long-term storage. 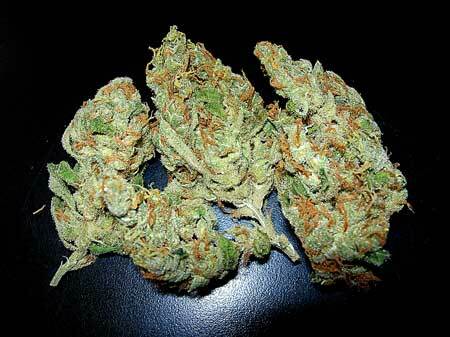 No Heat, No Middling Temperatures – Avoid letting buds be exposed to heat or middling temperatures. The temperature should be 60-70°F (15-21°C) or under 32°F (0°C) for the best results. Don’t let buds get cold, then hot, then cold, etc. Don’t store them near electronics that may heat up. Try to maintain a steady temperature until you’re ready to use your buds. Glass is Best, Avoid Plastic or Metal – Although plastic and metal can be used to store buds in the short term, they can start to affect the smell/taste after a while. Therefore they are not recommended for long-term storage. Plastic also tends to be “static-y” which can cause trichomes to fall off the buds and stick to the sides or the bottom of the container. Your best bet is glass, which is completely airtight and nonporous. Quart-sized mason jars are a tried-and-true storage container, which is why they are so popular for cannabis growers. If You Do Go For a Wood Container… avoid cigar humidors as they can impart a cedar taste. Cannabis-made humidors are usually made out of things like teak, bamboo, acacia, mahogany, cherry or walnut wood, as these won’t affect the smell/flavor of your buds. However, wood doesn’t seem to be as effective as glass when it comes to cannabis storage, and buds won’t last as long when compared to being stored in glass. Avoid the Refrigerator – Although refrigerators might seem like a great idea, they don’t maintain a consistent humidity and temperature. These fluctuations increase the chance of mold and other unwanted biological processes. Keep your buds at a cool room temperature or in the freezer. 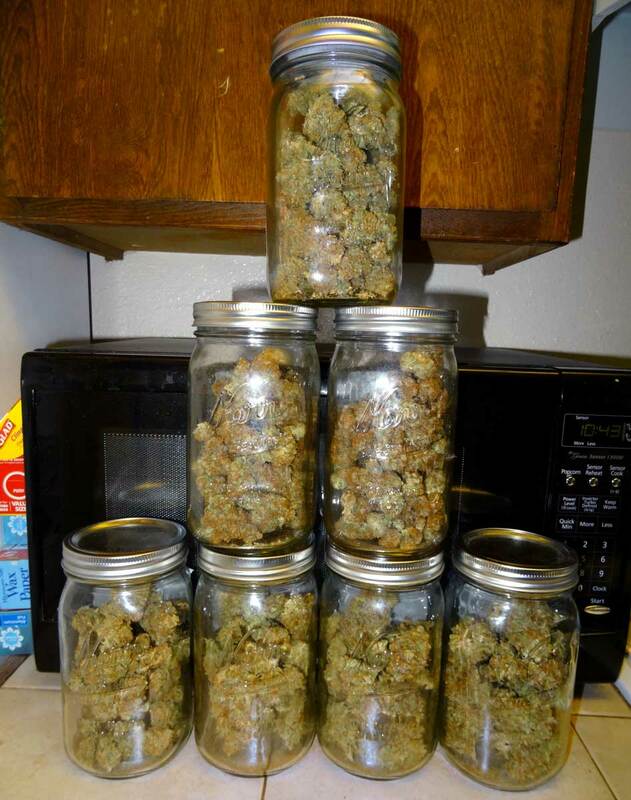 Now that you know how to store your marijuana properly, you can enjoy every big harvest for years to come! What will my electricity bill look like if I start growing? Oh no! How can we improve? Let Us Walk You Through Your First Grow! Is it safe to order cannabis seeds online? Can You Grow Cannabis in a Mini Tent? Best Place to Grow Cannabis in the House? What is “Schwazzing” & How Does it Increase Cannabis Yields? Learn About Our New Online Growing Class! Cannabis Cloning Made Easy… Roots in 7-10 Days! Has Mosaic Virus Finally Spread to Cannabis? How Long Does It Take to Grow Weed Indoors? Newsletter Reader Pics: December 2018 Edition! What Happened to all the SM-90?! Solventless Extraction Showdown - Bubble Hash vs. Dry-Ice Hash! All-Natural Pesticides - Safe Up to Harvest! Where in the World is Cannabis Legal? Haven't Started Growing? Learn What Supplies You Need! Which Cannabis Nutrients Should You Use? What is the Cannabis “Fluxing” Technique? How Far Away Do I Keep My Grow Lights? Why Are Cannabis Leaves Turning Yellow?